Detecting Videos, Lost & Found, Stories, etc. Local FOX channel 35 aired this video after our club (The Central Florida Metal Detecting Club) found the key piece of evidence that helped solve a murder crime in Osceola County. Below is a letter I received from Kyle and Danielle Wolpert. They lost a beautifl ring in the summer of 2013 and I was thrilled to be a part of helping to fing it. following your website and all of the great things that you do! Thanks and all our best! others wished to pursue the search. to repeat what he had said as I was certain I had heard him incorrectly. found buried ankle deep in the sand underwater. November 20, 2013. FloridaRob returning the lost earring. White gold with black diamonds. Wednesday November 20, 2013. I was out on my weekly Wednesday hunt when I received a phone call from Jerry Fournier. He had found me on my website. He was desperate to find a lost very valuable earring and asked for my help. I had my gear and was able to head right over to his home. He told me he had been playing basketBall and had taken off the earrings which were white gold with many many black diamonds. He had them in his vehicle until he returned home. 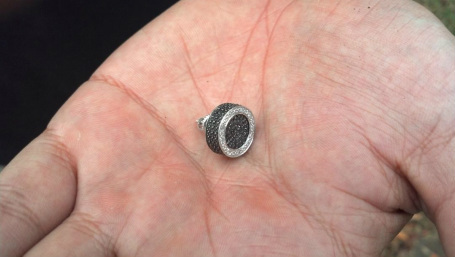 He put them in his top pocket before getting out of his vehicle and once inside his home realized he had a hole in his pocket and one of the earrings was missing. He had looked for 2 days including raking and scouring his yard with no luck. After about 30 minutes I was able to retrieve the lost earring and make Jerry very happy. March 18, 2015. I received an email from a fellow that found my website from a Google search. He had lost his wedding band while doing yardwork and asked for my help in finding it. I love helping with situations like this so I offered my help. I went to his home at 8:30 in the morning. He showed me the areas he was working in. I began gridding the area for over 2 hours with no luck. I took a 15 minute break and then began again. This time I just started looking over the area and thinking where it might be. I noticed he had also trimmed some branches from some tall hedges so I crawled under them and began scanning with my coil and with my eyes. Then BOOM! There it was lying right close to the chain link fence. Another thrilling return. August 24, 2016. 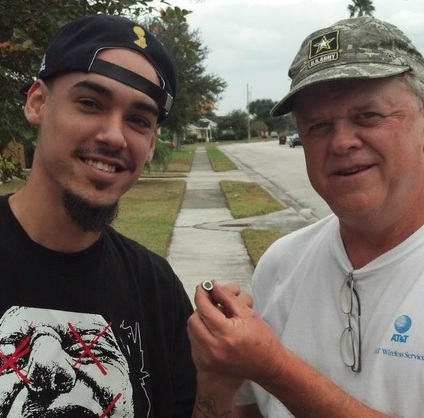 Found this lost white gold ring for a couple visiting Orlando from England. Click Image to see the live video. August 30, 2016. 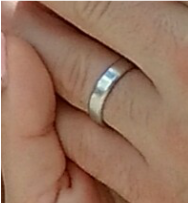 A couple from New Jersey lost this Platinum wedding band here in Orlando. I was able to find it for them and get it back on his finger where it belongs.